I have a lot to say about this one -- though if you don't like to read about the process, feel free to skip down to the photo lol. It was looking very, very doubtful that I'd even get a wristband as I was stuck in horrific traffic leading through the Lincoln Tunnel (the story of my life). I ended up arriving to Barnes and Noble at 9:15 AM and the line wasn't too crazy -- don't get me wrong, there was a TON of people but I heard from Ira (and others) that the line extended 2 city blocks long well before 9:00 AM. As it turns out, some people arrived at 11:30 PM the night before (they were even featured on the Today Show this morning!). It took about 10-15 minutes to enter the store where everyone lined up at the registers. Soon after, the store manager announced that they had sold out of white wristbands but would be giving out brown wristbands. He said white wristbands were given to the first 300 people and they would be brought up to the Event space on the 4th floor starting at 5 PM. Brown wristbands would line up at 6:00 PM and would gradually be brought up once the White wristbands started to filter out of the Event space. I buy the book and something told me to double check with the cashier about the brown wristbands. I asked him, "So I'm guaranteed to get a photo with Cena?" and he said he wasn't sure and called another bookseller over for confirmation. The bookseller told me, "No. Brown wristbands are 'Standby' tickets. It's up to Cena if he wants to meet anyone with a brown wristband.'" He then told me that I should take the gamble as I could always return the book if I don't get the photo. I decided to buy the book and saw the store manager talking to a mother with her young son. He was assuring the mom that EVERYONE would meet Cena and the process would be super fast because it was just a photo op. The mom said, "So I won't be out of here at 9:30?" and he said, "Oh no, no, 7:30 at the latest if you start lining up at 6. This is just a photo op." I double confirmed with the manager that I'd get the photo op and he said "Yes." I told him that his cashiers were saying brown wristbands were just "Standby" tickets and he said that was wrong information and apologized. So later on in the day, I called B&N to see if they were selling any more wristbands and I was told they had a few left. I was also curious if they were still telling people if brown wristbands were "Standby" tickets so I asked and, sure enough, they told me brown wristbands were "Standby" and not guaranteed to meet Cena. I then spoke to the manager, who once again apologized and sounded furious that his booksellers were still giving out wrong information. Fast-forward to 6:00 PM and the line is significantly longer than at 9:00 AM. Here's what struck me: I saw a mix of white, brown, and GREEN wristbands in the line. Security was pulling anyone with a white wristband out of the line and into the store (good!) but I was confused about the green wristbands. As it turns out, they sold out of brown wristbands and decided to hand out green wristbands. People showed up at 5 PM, bought the book, and were given a green wristband -- and they were in line in front of people who showed up at 9:00 AM (or sooner) and were given brown wristbands. One of the security guards said that Brown and Green wristbands were being mixed together "since everyone is guaranteed to meet Cena." 6:30 comes and there's no sign of Cena. As it turns out, he was "stuck in traffic" and didn't arrive until ~7:00 PM. Still, the line didn't move for quite some time and, even then, we only moved about 50 feet as we neared 8:00 PM. There was still about 100-150 people ahead of me and another 100-150ish inside. I couldn't envision meeting Cena at this rate. I decide that enough is enough. I've been waiting on line for well over 2 hours and we moved about 50 feet. I was dead tired after a full day of work and still had to head back to New Jersey so I decided to return the book and give up. I ask the security guard if I can just go into the store to return it and he said yes. He mentioned that Cena was signing for every kid who asked and taking time with everyone, which made the line move incredibly slowly. I'm about to enter the store when another security guard asks me why I wanted to return the book. I explained to him that I had been waiting for 2 hours and just wanted to go home. He asked me what color wristband I was and said, "Oh you're brown! You should be next!" and then asked me where I was in line. I told him, "I was down the block and around the corner" and he replied, "Why? Brown wristbands go before anyone with green, you should be right here!" and pointed to a group of people right by the door. "You'll go up next, I promise." I told him that I appreciated his help but I just wanted to go home (which seemed to upset him). I go inside, return the book, and I decided to speak with a manager. I told her about all of the miscommunication from this morning, how I thought it was unfair for people with green wristbands to be permitted before brown wristbands, and told her that the security guard even said I shouldn't have been that far back in line." She was incredible. She listened and understood what I was saying and said, "If you buy the book back, I'll take you upstairs myself. You'll sit down and wait for your row to be called. I am so sorry about all of the miscommunication and, yes, brown wristbands should've been let in before green." I was blown away and thanked her. I get up the event space and I actually ran into an old manager of mine before being seated in the same row as Greg! The process was really weird. There were several rows of chairs setup along the event floor and the rows behind us were being called to lineup. As it turns out, I believe that row was filled with the last of the white wristbands. Once they were called up, they then started to call up the rows in front of me. I sat for about 45 minutes to an hour before our row was called. We were told that cell phones had to be put away once we reached the stage. 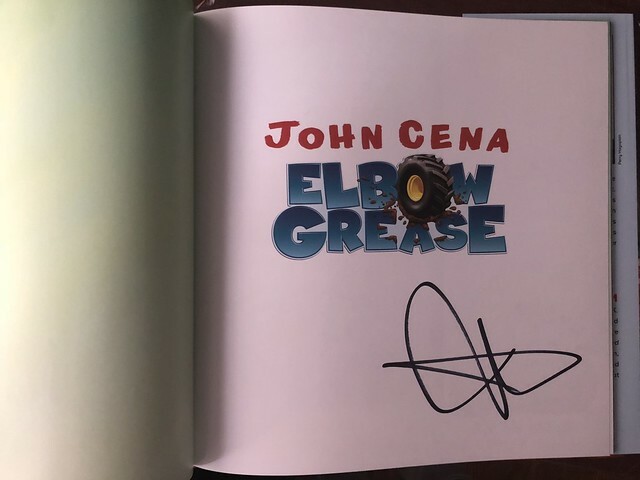 I did see Cena signing extras for kids but didn't see him do anything for adults (though, to be fair, I didn't see any adults asking him to sign stuff, so no clue if he said no though I imagine he didn't). It was finally my turn and Cena greeted me very warmly. We took the photo and I told him I really appreciated what he does for kids and he said, "Thanks, man, it's my pleasure." That was that. I claimed the card that had the info on how to download the picture (it was available instantaneously)I chatted with my old manager for a bit before claiming my pre-signed book and headed out, where Greg and I chatted for a bit. All in all...I like the photo and I'm glad to meet one of the biggest names in recent wrestling history. I thought the process was maddening, though. As I understand it, they were **still** selling books with wristbands around 8:30 PM. I'd imagine there was well over 500 people at the event: 300 white wristbands sold and there had to be an additional 200ish brown and green wristbands. Amazing. Glad you got the op. Doesn't really sound that bad though as I would have simply made myself ahead of line once I was told brown was after white. It definitely worked out -- also, I saw those people by the door wwwaaayyyyy back in the Event floor, so I'd probably been there another 30 mins - 1 hour if I just hopped on. Plus, I may have wasted two hours because one security guard said brown and green were mixed while the one at the door insisted brown went first. And yeah, that's another part of the story. I had plans to meet up with some friends to watch the game though I was able to stream it on my phone (I didn't miss much). Bummer of a game, February is too far away. Offseason should be interesting, though. wow, sounds like an interesting time. One of my student's went to this signing & he seemed to enjoy himself & glad you got what you wanted. Well despite Cena starting late, which I knew was the case given he was on The Tonight Show, felt it was well managed and moved decently quick. If you're a WWE fan couldn't have been better. Cena was great with the little kids too. Get a an A+. I was there and fortunately had a white wristtband...To add to this a bit once Cena got there it still didn't really start right away, there was a group of "VIPS" that went first and then a decent handicap line. After that they finally started taking the white wristbands, I got there around 4:30pm and was sitting upstairs until around 8:00 and then my row was finally called. Overall I felt it was ran smooth and the staff communicated well at least upstairs. They kept saying no additional autographs and no phone photos but I firsthand saw not only kids but adults get things signed and selfies. He did not say no to anyone that asked anything. When I got up there security asked me to not take my phone out, I had no plan to do so anyway and I told her I fully understand the process and dont want anyone waiting any longer than they already have. Cena liked my shirt that I was wearing and started laughing (I wore a football is fake shirt) and I just said a few quick things and that was that. Overall not a horrible experience but a long one. Other than the long waits, seems like everything was run pretty well for the most part. Photo Op came out great. Good job sticking through that mess...it's a great photo! Thanks, man. I wish you could've made it. I thought it was well managed to a point. If brown really went before green, I wasted a good amount of time as there were many green wristbands in front of me. Agreed on Cena, A+ dude. Wow, thanks for the additional info. How does one score a VIP ticket? 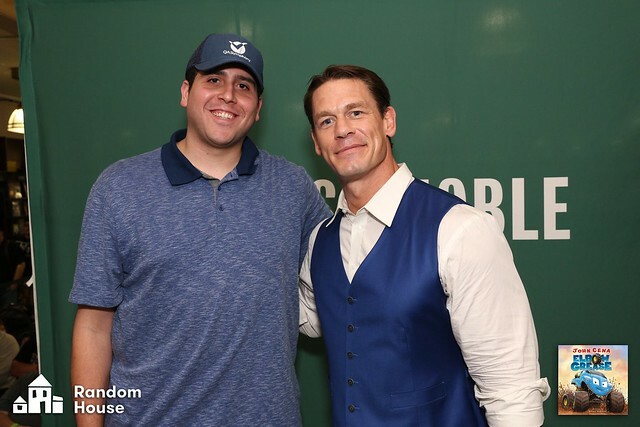 I'm glad Cena dug your shirt! I just wanted to let you know I sent you a private message, check it out when you have time.